Direct Drive | Product categories | Renaissance Graphic Arts, Inc.
Speedball has partnered with Ravi Engineering Works in order to capitalize on their over 50 years of experience in the manufacturing of etching presses, and the result is the ultimate combination of quality and value. 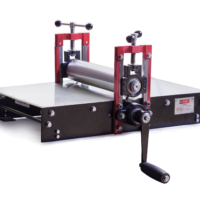 Designed to be ideally-suited for a range of techniques, Speedball Etching Presses can be used for printing etchings, monotype and dry point plates, woodcuts and linocuts. Speedball Etching Presses also include a 5-year full replacement warranty.